Do Bacteria, Fungi and Viruses Scare You? They should!! the result of microorganisms taking hold in your body. Thankfully, Silver Biotics products, that utilize the amazing and patented Ag 4 O 4 pathogen killing molecule, give mankind a path to avoid suffering from these tiny villains. American Biotech Labs (ABL) Silver Biotics products, also known as Silver Sol and ASAP silver products, are completely different and much more effective and safer than colloids or ionic silver solution type products. In just 15 seconds contact time, American Biotech Labs products destroy 80% of pathogenic microorganisms that they touch, and in 6 minutes, virtually 100%. Unlike with other companies, our nanosized silver products have been thoroughly tested for more than a decade (with more than 200 studies and more than 10,000 laboratory tests) and proven to be safe and effective. ABL’s patented silver molecule products truly help people to gain the upper hand against the tiny destroyers of health called pathogens. With these products, you can forget your fear of missing work or other important events or of feeling miserable when you could be feeling great. You and your family’s health deserve real, proven solutions. Harmful microorganisms are able to wreak a special kind of havoc on humans. Ask anyone who has experienced Lyme disease, malaria, black mold, Epstein-Barr, flesh-eating bacteria, pneumonia, a severe herpes, flu, or even just a persistent cold about the amount of suffering caused by pathogens. Very often, back pain, stomach pain, sinus pain, sore throats and headaches are the result of unrecognized assaults on our tissues by viruses, bacteria or fungi. That is why Silver Biotics can be one of your best friends in life… by helping you feel your best always. Insidious auto-immune diseases also often have their roots in chronic viral or bacterial infection. And, amazingly, even with doctors’ and nurses’ full attention and all available modern antibiotics, over 18,000 people a year die because of hospital-contracted MRSA bacteria which have developed resistance to antibiotics. Fortunately, ABL’s patented silver molecule is capable to help the human body to overcome virtually all pathogens, including viruses that antibiotics can’t touch. With Silver Sol technology available in Silver Biotics, Silver Biotics Gel, and Pet Shield, both you and your pets can stay relatively untouched by the small microorganisms that are behind so much human suffering. Thankfully, Silver Sol has been shown in several studies to NOT kill friendly bacteria and not inhibit their growth in the slightest. Therefore, you don’t have to worry about bowel changes or getting a yeast infection by causing gut flora (good bacteria) die-off, like you do with antibiotics. So, even if Silver Biotics products only help one avoid flu and colds (not to mention Lymes, flesh eating bacteria, etc.) they are well worth using. Please keep perusing our web site to learn more. Pathogenic microorganisms cause human suffering — not only through infections, colds and flus, but also through degenerative disease that develops when harmful microorganisms live in the body in low enough levels to go unnoticed, but sufficient to cause tissue damage. Autoimmune disease, cancer and coronary heart disease have ALL been shown to result from microorganisms living chronically in the body and causing both direct and inflammatory damage to tissue from endotoxins (endotoxins means the excrements of bacteria). Also, very often, back pain, abdominal pain and headaches are the result of toxins released as one’s immune system kills off microorganisms that are trying to gain a greater foothold in the body. So, it’s a wise habit to take Silver Biotics regularly and maintain a healthier, “feel-well” body. And, at the first sign of a sinus tickle, sore throat, cough or headache, take Silver Biotics to help quickly put an end to it. With numerous safety studies showing complete safety, and additional studies showing that friendly bacteria are unaffected by Silver Biotics (not even their growth rate is reduced) there is no downside to Silver Sol/Biotics use… but, rather only a terrific upside. We invite you to get a free book about our silver molecule entitled Silver: Nature’s Natural Healer. Nothing helps makes a “germ- free” life more of a reality than Silver Biotics. Pathogens are all around us…ready to enter our mouths, noses or cuts in our skin — and cause malaise, illness or infection! taking hold in your body. Thankfully, Silver Biotics products, that utilize the amazing and patented Ag 4 O 4 pathogen killing molecule, give mankind a path to avoid suffering from these tiny villains. American Biotech Labs (ABL) Silver Biotics products, also known as Silver Sol and ASAP silver products, are completely different and much more effective and safer than colloids or ionic silver solution type products. In just 15 seconds contact time, American Biotech Labs products destroy 80% of pathogenic microorganisms that they touch, and in 6 minutes, virtually 100%. Unlike with other companies, our nanosized silver products have been thoroughly tested for more than a decade (with more than 200 studies and more than 10,000 laboratory tests) and proven to be safe and effective. ABL’s patented silver molecule products truly help people to gain the upper hand against the tiny destroyers of health called pathogens. With these products, you can forget your fear of missing work or other important events or of feeling miserable when you could be feeling great. You and your family’s health deserve real, proven solutions. Harmful microorganisms are able to wreak a special kind of havoc on humans. Ask anyone who has experienced Lyme disease, malaria, black mold, Epstein-Barr, flesh-eating bacteria, pneumonia, a severe herpes, flu, or even just a persistent cold about the amount of suffering caused by pathogens. Very often, back pain, stomach pain, sinus pain, sore throats and headaches are the result of unrecognized assaults on our tissues by viruses, bacteria or fungi. That is why Silver Biotics can be one of your best friends in life… by helping you feel your best always. Insidious auto-immune diseases also often have their roots in chronic viral or bacterial infection. And, amazingly, even with doctors’ and nurses’ full attention and all available modern antibiotics, over 18,000 people a year die because of hospital- contracted MRSA bacteria which have developed resistance to antibiotics. Fortunately, ABL’s patented silver molecule is capable to help the human body to overcome virtually all pathogens, including viruses that antibiotics can’t touch. With Silver Sol technology available in Silver Biotics, Silver Biotics Gel, and Pet Shield, both you and your pets can stay relatively untouched by the small microorganisms that are behind so much human suffering. Thankfully, Silver Sol has been shown in several studies to NOT kill friendly bacteria and not inhibit their growth in the slightest. Therefore, you don’t have to worry about bowel changes or getting a yeast infection by causing gut flora (good bacteria) die-off, like you do with antibiotics. So, even if Silver Biotics products only help one avoid flu and colds (not to mention Lymes, flesh eating bacteria, etc.) they are well worth using. Please keep perusing our web site to learn more. Pathogenic microorganisms cause human suffering — not only through infections, colds and flus, but also through degenerative disease that develops when harmful microorganisms live in the body in low enough levels to go unnoticed, but sufficient to cause tissue damage. Autoimmune disease, cancer and coronary heart disease have ALL been shown to result from microorganisms living chronically in the body and causing both direct and inflammatory damage to tissue from endotoxins (endotoxins means the excrements of bacteria). Also, very often, back pain, abdominal pain and headaches are the result of toxins released as one’s immune system kills off microorganisms that are trying to gain a greater foothold in the body. So, it’s a wise habit to take Silver Biotics regularly and maintain a healthier, “feel-well” body. And, at the first sign of a sinus tickle, sore throat, cough or headache, take Silver Biotics to help quickly put an end to it. With numerous safety studies showing complete safety, and additional studies showing that friendly bacteria are unaffected by Silver Biotics (not even their growth rate is reduced) there is no downside to Silver Sol/Biotics use… but, rather only a terrific upside. 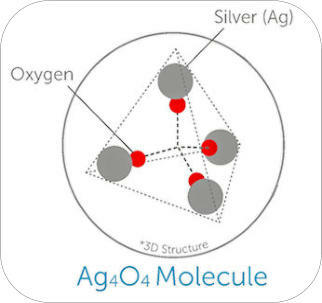 We invite you to get a free book about our silver molecule entitled Silver: Nature’s Natural Healer. Nothing helps makes a “germ-free” life more of a reality than Silver Biotics.